Early to bed, early to rise. We started at 6:00 a.m. from Dharapani, crossing over the bridge to the small Tibetan refugee village of Thoche. We followed the route described in the 2016 edition of "Trekking the Annapurna Circuit", walking along the gravel road, and soon found ourselves at a dead end. Since 2016, roadwork has continued and extended further beyond the point described by the book authors. We spent about 15 minutes analyzing the safest path to the plateau above. We back-tracked a few hundred meters and climbed a rickety ladder to a house situated above the newly-carved road. From there, a young woman directed us up a steep slope behind her home. We followed the path and popped out onto a stretch of flat plain. Villagers from Nasku, tilling the land in preparation for Spring planting, waved as we passed. At the far end of the plateau, the trail bifurcated and we were a little unsure if we should continue straight or take the descending trail to the left. We headed down and, with relief, finally saw the red and white Annapurna Circuit trail markings as we neared the bottom. We crossed back over the Marsyangdi River and through Danaqyu. At the far end of Danaqyu, the guide book description was again impacted by current events. We eventually found the small wooden bridge, crossed, and trudged up the long staircase on the other side. Crossing the road at a several points, we were primarily hiking through a dense, secluded forest. 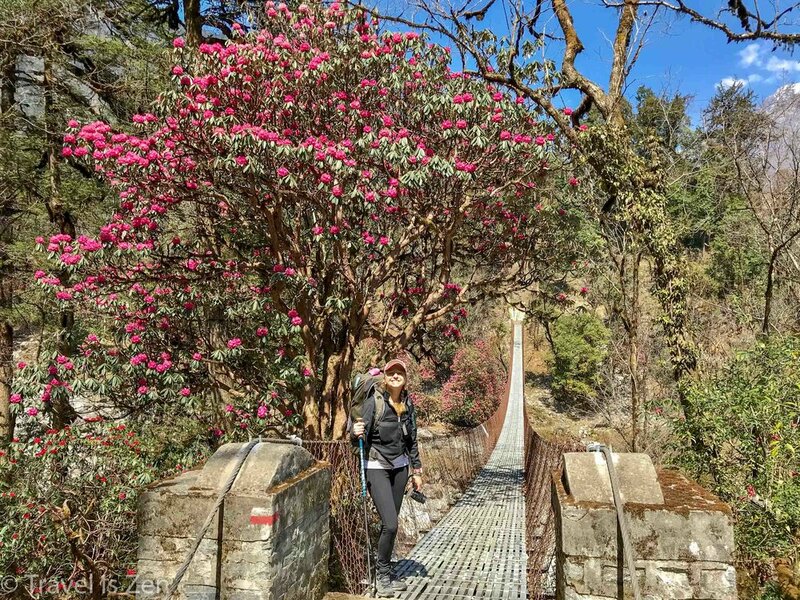 Just as we were getting hot and irritated, we were surrounded by bright pink and crimson rhododendrons in spectacular bloom against a backdrop of snow-capped mountain peaks! We had a long lunch and relaxed for a couple of hours in Timang, enjoying the view of Manaslu peak from a rooftop restaurant. It was tough to get moving again, but we still had another three hours to Chame. As we experienced the day before, the wind began to pick up in the afternoon hours. We had a few more steep climbs, took the longer route through the lovely ridge-town of Thanchouk, bought some dried apples in Koto, and finally shuffled into Chame at 2650 meters above sea level as the sun was setting. 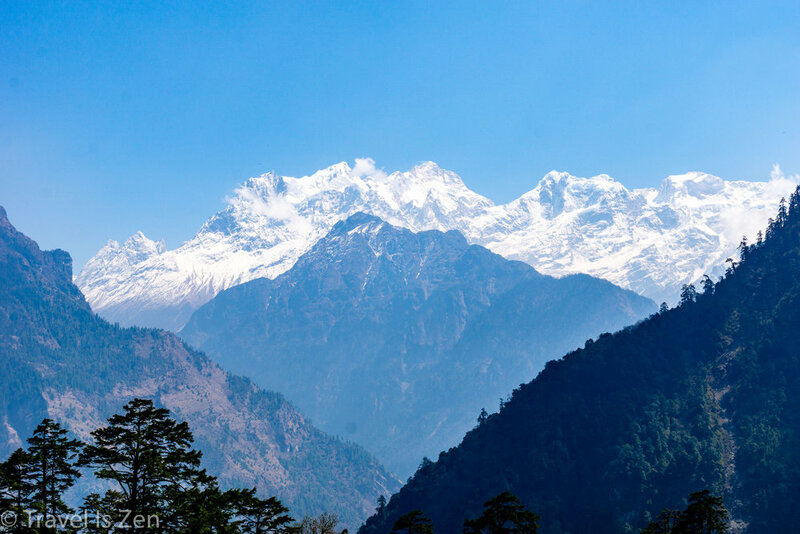 In retrospective, the hike from Dharapani to Chame is over 3700 feet - the largest ascent in a single day that we experienced on the eastern side of Thorong-La Pass.